Fueled by the drive to be bigger and better, today's church has adopted principles and practices created by the corporate world. The result is a toxic mix of the spiritual and the secular, where success is measured in numbers, and pastors are encouraged to become CEO superstars. In short, the world is influencing the church How do we get back to a biblical foundation for leadership and church development? 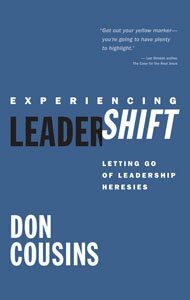 Trusted and best-selling author Don Cousins will take you on a groundbreaking exploration of what makes a church leader successful. Lead using the gifts God has given you. Fulfill your calling to be a leader who equips others for the work of service. Experience God's blessings as you carry out His work, His way.